Continuing the amazing list of personal games that touch on difficult subjects comes this Twine game called "What's in a Name?" It's about how someone learns they are bisexual, only to second-guess themselves because some folks in the LGBT community aren't accepting of that sexuality. The idea is that you're either straight, or you're gay. That's it. This is all so new to you and you marvel at what you've found. It's actually kind of beautiful, knowing that you could potentially find love with either gender. And now that you FINALLY know who you are, it's time to find your place in the LGBT community. Time to find your place in the place you know is yours. Even if that situation doesn't apply to you, the game is still touching: it's heartbreaking to see someone struggle with their identity because others reject who you are. The purpose of the game is to let you into that struggle, but if you happen to be dealing with something similar, then perhaps the game can help you come to terms with your issues too. And since it's a Twine game—meaning, it plays kind of like a choose-your-own-adventure book—anyone can play it. 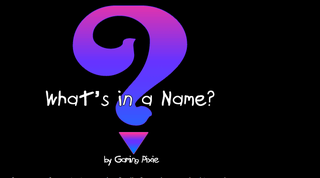 Try out Gaming Pixie's What's in a name? here. It won't take more than ten minutes and it'll be worth it. Finally: of course this game doesn't speak for all bisexual experiences. But it's a common one that many people do face.